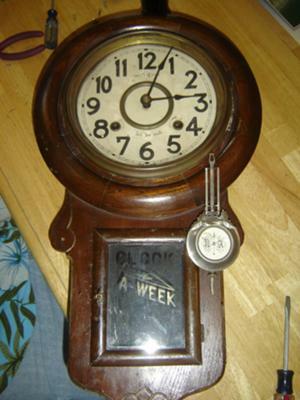 I know NOTHING about this clock except that I found it tucked away in my Papa's barn last summer. I know he was in Japan during WW1,but whether it came from from there or not I have no clue. I would love for someone to tell me the approximate year it was made,something about the maker,and or if it has ANY kind of value(not that I'd sell)? Thanks for any kinda help info or anything that will help me out with this clock! 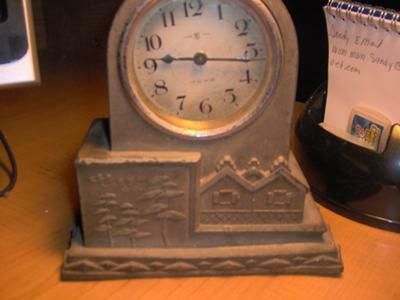 The Maker is TOYO and the trademark has a T with a C intertwined inside a crest and looking at the back,it appears it was an alarm clock. 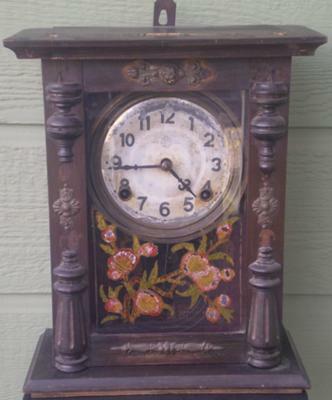 Hello, recently my parents went on a trip to CO to visit family and they were given an old clock as a gift and we are trying to figure out the actual maker, where (city) it was made, and how far back it actually dates. All I can make out is that it is made in Japan and has some Japanese writing on the back faceplate. It also has a date, maybe, "14-6-13."